Plant of the month. March 2015 THE ELDERBERRY FAMILY – Glacier View Landscape and Design, Inc.
Glacier View was hard at work planting in February’s warm spell here along the Front Range and we were landscaping Boulder, Lafayette and other fine Colorado residences, but alas, the snow arrived full force with February ending as the snowiest in history. This gives opportunity to prepare a spring plan for fertilizing and mulching for the wonderful spring bloomers. Among my favorite is from the Elderberry family of plants (Sambucus). The two I find most attractive and loyal are Black Lace and Madonna. Both are the European Elderberry (Sambucus nigra). Also common are the American Elderberry (Sambucus canadensis) but generally grow smaller than the European. Both produce black berries and are edible. The Red Elderberry (Sambucus racemosa and pubens) produce red berries and are poisonous. 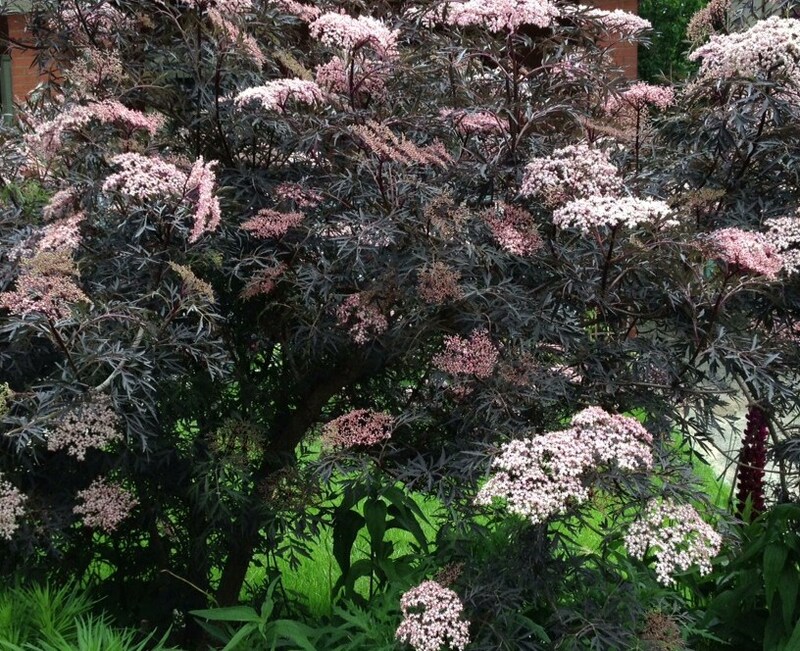 The Black Lace Elder has feathery lacy dark burgundy to almost black leaves, springs to life in May with flat topped 6” diameter burgundy flowers that open pinkish/purple to white, and produce black berries mid to late summer. This one is a show stopper for all these reasons. They grow 6-8’ high, but can be kept pruned to a more reasonable 4-6’ if the space requires it. Black Tower Elder is a cultivar that stays narrow. It only grows 3’ wide and 8’ tall. They are fine with moderate watering, can handle a heavy soaking, but prefer not to dry out too much. They can be pruned aggressively and should be cut back to 2’ every 3-4 years. This promotes a bushy plant, allows one to remove dead material, and promotes healthy blooming. Their lacy appearance provides great texture to the backdrop of a perennial garden. The Madonna Variegated Elderberry has a white and green medium sized ovate leaf, grows a little taller at 8’-12’ high and wide, and produces white flowers. I like this variety of variegated Elderberry because it does not get as large as the standard (Sambucus nigra marginata) which gets 15-20’ high and wide, which is usually too large for most residential properties. But, by all means, if you have the space, marginata Elderberry are great showy fillers for larger properties due to their large size. The Golden Elder (Sambucus canadensis ‘Aura’) is the most common American Elderberry used here in Boulder Colorado landscapes. It too produces black berries that are edible, but is more appropriate as a backdrop planting rather than a showy character garden focal point. The Red Elderberry are pretty in their own right, both Native (Sambucus pubens) which grows low and wide (4-6’ high and 8-12’ wide), or the European Red Elderberry (Sambucus racemosa) which grows 6-8’ high and wide. However, nausea ensues if ingested, but it won’t kill you! If you have a penchant for edible landscapes then plant only the black Elderberry. The berries are best harvested in late August to September, before the first frost, and do not store well at room temperature, so refrigerate and process quickly. The raw berries are astringent and will have a bitter taste, but processed berries exude a sweet flavor. The berries can be processed into jams, jellies, pies, and even wine. Cut the entire cluster and strip. Fifteen pounds can be harvested from a mature plant. And, if you don’t want the berries, the birds will surely take them away. Plant some in your Boulder Colorado Landscape for years of enjoyment! We’re proud to serve communities near Lafayette, Colorado with our landscape design & installation services.